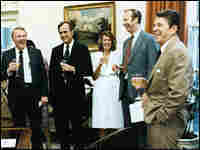 Oral History Recalls the Reagan White House Seventeen years after Ronald Reagan left office, the public will be able to get an inside look into his presidency. Key figures from the Reagan White House recently took part in an oral history project, shedding light on the political career of the country's 40th president and offering insights into his leadership style and personality. 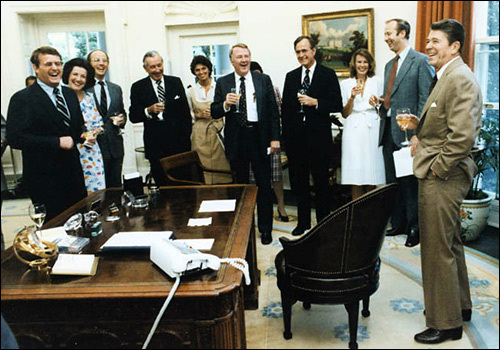 On July 29, 1981, President Reagan and his staff celebrated approval of a tax overhaul. Seventeen years after Ronald Reagan left office, the public will be able to get an inside look into his presidency. Key figures from the Reagan White House recently took part in an oral history project, shedding light on the political career of the country's 40th president and offering insights into his leadership style and personality. Stephen Knott, associate professor and overseer of the Ronald Reagan Oral History Project at the Miller Center of Public Affairs at the University of Virginia. Robert Dallek, presidential historian; biographer of Franklin D. Roosevelt, Lyndon B. Johnson and John F. Kennedy. Michael Schaller, professor of history, University of Arizona; author of Reckoning with Reagan: America and its President in the 1980s and the forthcoming Right Turn: American Life in the Reagan-Bush Era, 1980-1992.